The recently enacted Jewish Nation-State Law of the Jewish state of Israel declares not only that Israel is "the nation-state of the Jewish people", it also states that national self-determination "is unique to the Jewish people". This makes Gentile people living in the Jewish state of Israel, at best, second-class citizens. Avi Dichter, the Knesset member who originally sponsored the Jewish nation-state bill, said, "We are enshrining this important bill into a law today to prevent even the slightest thought, let alone attempt, to transform Israel to a country of all its citizens." This is a blatant promotion of Jewish superiority over all other people living in Israel. The Jewish Nation-State Law extends Jewish superiority to adjoining lands with its statement that Jewish settlement "is a national value", which gives a green light to expanding Jewish settlements on Palestinian lands. As an objective look at the Hebrew Bible shows, the Jewish superiority of the Hebrew Bible extends to all Gentile (non-Jewish) people around the world, and is not at all limited to the Palestinian people. 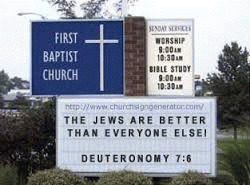 The Jewish superiority clearly promoted in the Jewish nation-state law has its roots in the Hebrew Bible/Old Testament. The ancient Hebrews and Jews who wrote the Hebrew Bible placed great importance on Hebrew/Jewish superiority over all other people along with the promotion of the Jewish state of Israel over all other nations. For me the Jewish religion like all other religions is an incarnation of the most childish superstition. And the Jewish people to whom I gladly belong ... have no different quality for me than all other people. As far as my experience goes, they are also no better than other human groups, although they are protected from the worst cancers by a lack of power. Otherwise I cannot see anything "chosen" about them. Now that there is a Jewish state of Israel, they are no longer "protected from the worst cancers by a lack of power" as the Jewish nation-state law, as well as the expanding and cruel Jewish state occupation of Palestinian lands, are making very clear. The Hebrew Bible, which Israel is based upon, not only promotes Jewish superiority, it promotes Israel over all other nations on Earth. This is evident by objectively reading verses such as Deuteronomy 28:1, which claims God told Moses and the Hebrews/Jews/Israel that "the LORD thy God will set thee on high above all nations of the earth" and verse 28:10, which claims God said, "And all people of the earth shall see that thou art called by the name of the LORD; and they shall be afraid of thee." Israel's growing nuclear, chemical and biological stockpile of very real Weapons of Mass Destruction, along with a growing fleet of high-tech German-made submarines that can deliver the Jewish state's WMD virtually anywhere on Earth, give this threat from the Hebrew Bible much more importance and significance. The current state of Israel's Jewish nation-state law is very undemocratic in spite of the fact that Israel is often falsely advertised to be a democracy. Since Israel does not have a constitution due to the belief in Judaism that man-made laws cannot take priority over God's laws/the Torah (this is similar to Osama bin Laden claiming America's founders were wrong to put man-made laws above God's laws, in bin Laden's belief God's laws are the Quran and other Islamic writings), Israel's Basic Laws are in place of a constitution. These Basic Laws take precedence over all other laws in the Jewish state. The new Jewish Nation-State law is a Basic Law. It strips away the delusion that it is possible to have a religious democracy. Nowhere in the Hebrew Bible is democracy or a republican form of government ever promoted. Should Religions be Held Accountable for Their Promises? Was C.S. Lewis, Author of Mere Christianity, an Intellectual?